Here, in one brief volume, are the answers to these questions and many others. 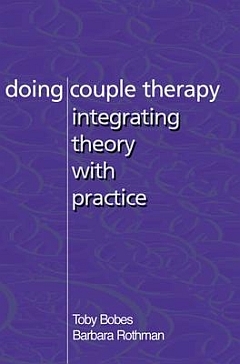 Doing Couple Therapy will be a lifesaver for family therapy students and beginning therapists. In a straightforward manner, the authors sift through years of family therapy theory to draw out for readers a a treasury of ways to sort out the many factors, past and present, that crowd couples' relationships. These include family-of-origin issues, previous relationships, secrets, children, in-laws, unresolves lodes, job demands, financial worries—to name just a few. The authors' framework, built from the major influential theories of family and marital therapy, will enable therapists to work effectively and briefly, though not superficially, with couples. The book not only presents theory but also links theory with practice. An extraordinary contribution is the presentation of a typical case from beginning to end, through tender moments, rough spots, family-of-origin work, revelation of deeply held secrets, alcohol abuse, ultimatums, and finally, renewal of commitment to the relationship. This practical, real-life guide to couple therapy will give both students and seasoned therapists a new take on the demanding work of couple therapy.